When each type is going through a phase in their life when they are in their shadow, it often causes them to present as a very unhealthy versions of themselves. There is debate on whether the best representation of our “shadow” is the opposite type entirely, or simply our regular function stack in reverse. In this article we are going to explore what happens when under high stress, causing the weaker functions to present themselves. This can be a truly difficult thing for anyone to go through, and is often difficult for those close to them to endure as well. Your shadow is described as the parts of yourself that you have little control or awareness of, oftentimes these are qualities we dislike in ourselves. When someone is under high amounts of stress, some of these weaker functions can present themselves in less than healthy ways. In many cases the best way to overcome this time of stress, is simply to ride it out. The weaker functions are showing themselves, because their dominant functions are not solving the problem at hand. Eventually the person under stress will need to revert back to their dominant functions in order to get back to normal. If this is something that continues for a long time, the individual likely has unresolved issues that need to be worked through on a much deeper level. The INFJ in their normal, healthy state of being- is kind, compassionate and extremely empathetic. They are often very consciously aware of other people’s needs, and are excellent at coming to conclusions about the future. The INFJ in their shadow, is oftentimes reckless and behaves entirely different to their norm. They might engage in behavior that is harmful to them, like heavy drinking or even drugs. The INFJ may even become rather promiscuous, which is not common for them at all. They will take risks, which they normally would not consider wise. The INFJ in their shadow will even find themselves trying to appear in control of the people around them, and they will do this by intimidating those people. The unhealthy INFJ will also use their Fe in a manipulate way, instead of a caring way. They will often do whatever it takes to get what they want from others- which is very different from a healthy INFJ. ENFJs in their natural state, are giving and warm individuals. They go out of their way to provide for those closest to them, and truly desire to make the world a better place. ENFJs primary focus is on the needs and emotions of other people, making them extraordinarily empathetic people. The ENFJ in their shadow, will find themselves neglecting the emotions of others, in hopes of finding a more practical or logical solution. They might struggle with being around people, and will find themselves wanting to be alone more often to figure things out. They will often become extremely critical, which can be a shock for the people closest to them. INFPs are usually very warm and dreamy individuals- with sensitive and passionate souls. They are seen as tender and caring people, who truly dislike the idea of harming others. They strive to be good, and are often focused on making the choices they believe to be the “right” ones. An INFP in their shadow, is much harsher and commanding than they usually are. They might find themselves saying hurtful remarks towards people who they feel are not doing things correctly. When healthy, INFPs will avoid conflict- but when the INFP is in an unhealthy state, they might find themselves provoking discord in their environment. ENFPs are normally very enthusiastic and warm individuals- with a charisma that draws people in. This normally warm person, will become someone entirely different when they are under high amounts of stress. An unhealthy ENFP presents themselves as dismissive to others, and even avoidant. They will often replay meaningless facts over and over in their minds, focusing on truly pointless information. While the healthy ENFP is open and eager to try new things- the unhealthy ENFP will find themselves doing the same type of task over and over again. They might even appear fearful to explore new ideas and hobbies. They might find themselves become extremely particular about a task, demanding that is be done “right”. INTJs are normally intelligent and logical individuals- with a strong drive and focus. They are great at strategic planning, and will survey their options before moving forward with most things. 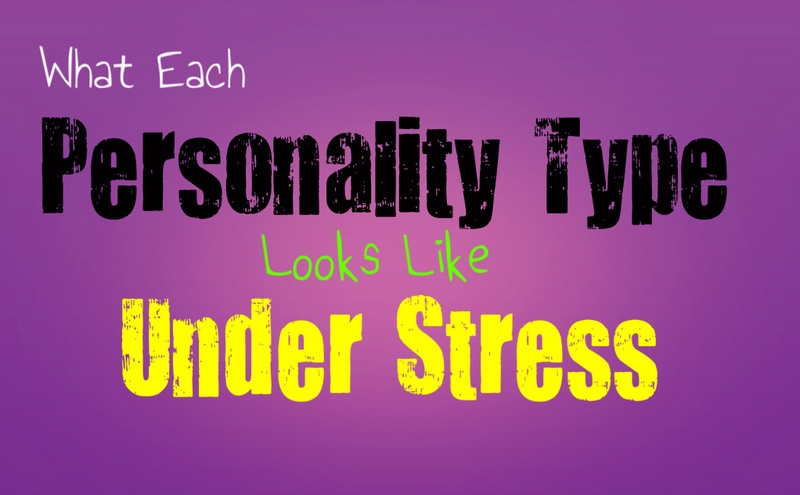 The INTJ who is under high amounts of stress, will often become entirely different from their normal selves. They will often take risks that they would normally never attempt- things such as excessive drinking, drugs or even driving well above safe speeds. INTJs will become reckless and commanding, wanting to focus more on the physical world around them. They might even find themselves challenging others to a physical altercation, which in normal cases would seem foolish to the INTJ. ENTJs are normally highly logical and analytical individuals, but when they are under high levels of stress, they will be very different. The ENTJ will become more focused on making moral decisions, and will try to figure out what they believe is right or wrong. They will often become much more defensive, and lose their ability to calmly rationalize the situation. They might be more reaction to others, lashing out if they feel like they aren’t being understood. This can be very upsetting for the ENTJ, since emotional control is something that is important to them. INTPs in their healthy state, are logical and intelligent individuals. They are great at observing a situation, and coming up with excellent ways to solve problems. They can often foresee potential outcomes, and find ways to improve upon the situation. INTPs when they are under stress and cannot seem to solve the problem with their dominant thinking function, will revert down the line until they end up at their inferior function. The INTP will become far too focused on the way other people are perceiving them, and might lash out because of this. They will feel incapable of figuring out the problem at hand, which will cause them to focus more on how the people around them are potentially judging or misunderstanding the INTP. When they are their usual selves, ENTPs are creative and explorative people. They enjoy taking on new hobbies and are constantly striving to explore the possibilities in the world around them. When an ENTP finds themselves in an unhealthy state of mind, they will often become much more guarded and safe. They might find themselves reverting to schedule, and will obsess over point and pedantic ideas. They might feel like things are not getting done the “right” way, and will find themselves wanting everything to be perfect. The ENTP will no longer attempt to explore new ideas, but will find themselves taking the safest option possible. ISTJs are extremely dependable and practical individuals. They are hardworking, and known as the type who are not afraid to get their hands dirty in order to do what needs to be done. An ISTJ who is under stress, might find themselves doubting their own decisions. They will feel like their might be a better way to go about things, and instead of following the path that they know to be useful- the ISTJ will attempt to explore new ideas. They might find themselves getting caught up in the possibilities, and might even begin considering a life change. ESTJs are naturally hardworking and practical people, but when they are under stress they become entirely different. They will find themselves focusing internally, and worrying about their choices. They might feel like they are not being perceiving properly, and will begin to second guess themselves. They might find themselves obsessing over morals, and will start to analyze themselves and the people around them. They will likely lash out at the people closest to them, believing that their actions are wrong or immoral in some way. ISFJs are normally focused on caring for their loved ones, and prefer to follow the path they are used to taking. ISFJs enjoy living by a schedule and this often goes by what they know has proven successful for them in the past. When an ISFJ is under stress, they become focused on observing the decisions they have made in the past. They might begin to doubt their path, and feel like they are going about things all wrong. The ISFJ might attempt to try making new choices, hoping that they can find a better path than the one they are currently on. This can be rather shocking for people close to the ISFJ, since it is definitely outside of their normal behavior. ESFJs are warm and compassionate individuals, with a strong desire to please their loved ones. ESFJs are normally focused on the emotions of others, and are naturally aware of how other people are feeling. When an ESFJ is under high levels of stress, they will lose this ability to focus on the needs of others. They will find themselves focusing on the more “logical” solution, and might become rather cold. Instead of being concerned with other people’s emotions, the ESFJ will focus on the things that need to be done. They might find themselves incapable of focusing on emotion, and because of this they will appear uncaring to others. ISTPs are normally very logical people, with a natural laid back demeanor. When they are under high amount of stress, their weaker functions will show themselves. The ISTP might become obsessed with how people perceive them, and because of this they will lash out at those around them. This will cause them to become much less focused on logic, and they will find themselves struggling to solve problems. ISTPs are naturally amazing at finding the solutions to most problems at hand, but when they are under stress they lose this focus and become drawn to their emotions. ESTPs are normally focused on living in the moment, and even though they are hardworking- they prefer to enjoy their lives. They are adventurous and charismatic people- but when they are under stress they are entirely different. The ESTP becomes focused on the future, and might find themselves stressing about tasks that they have failed to accomplish. They will lose their natural carefree demeanor, and will lose their sense of adventure. They will focus solely on avoiding risks, and will become obsessed with figuring out their next move. When an ISFP is themselves, they are warm and gentle souls. They enjoy focusing on the more creative sides of life, and want to appreciate the beauty around them. ISFPs are very visually focused, and enjoy absorbing all of the best things in life. An unhealthy ISFP, will often be very critical of others, and will focus on wanting to get things done. They might even be particular about the work being done around them, and will likely feel like people are not focusing hard enough on the task at hand. ESFPs are normally very entertaining and fun people to be around. They enjoy trying to new things, and love to take exciting chances. ESFPs want life to be an adventure, and will often jump into new things eagerly. When an ESFP is under stress, they become rigid and focused on planning. They might find themselves taking the safest road possible, in hopes of building a better future. The ESFP will not want to try new things, but instead will focus on the path that they are sure will be successful.